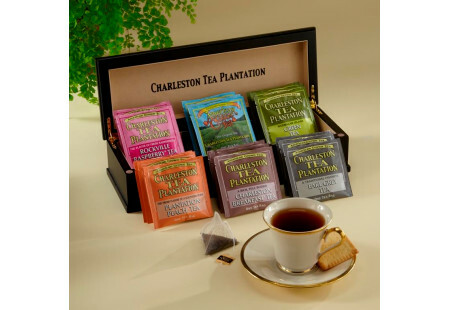 This wooden tea chest contains 3 pyramid tea bags each of 6 Charleston Tea Plantation flavors grown in the USA on the Charleston Tea Plantation - America's tea garden. Its matte black finish gives this 14-1/4" x 5" x 3-1/2" tea chest an elegant simplicity and wholesome appeal all its own. Make this tea chest a lasting remembrance, by personalizing it with engraving*. Allow up to 3 weeks for delivery for engraved products. Expedited shipping is not available. *Engraving text will be in a script font.